I thought it was all over...how wrong I was. 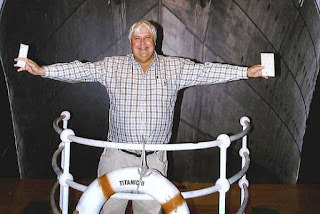 ...er, no, me neither...), but Titanic II - the real thing !! Titanic II (the real thing) is a full-size ocean liner described as an "exact replica of the Olympic-class RMS Titanic" about to be created with love, care and utter attention to detail, by Australian billionaire Clive Palmer who hopes the vessel will act as the flagship for his company Blue Star Line. 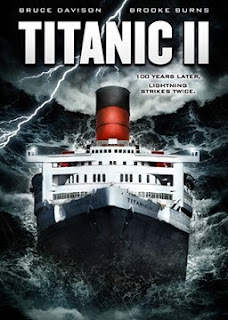 The intended launch for Titanic II, as far as I can ascertain, is April 2016, the ship being assembled in China, a move that Sky News has openly questioned, noting that there will be no guarantee as to "how achievable the project is and how safe the end product will be". There's no doubting, however, that the finished product will be popular, as the 1997 James Cameron film Titanic, staring Leonardo DiCaprio and Kate Winslet, remains, so I'm told, one of the top three bestselling films in China. AND, if the whole project couldn't be any more distasteful, the maiden voyage of Titanic II will apparently be between Southampton and New York, completing the journey that her earlier namesake famously failed to do. Titanic II has just been unveiled, amidst great publicity. I haven't studied the design in detail as yet, but I'm guessing that, despite claims to the contrary, it isn't a perfect replica of the original Titanic...this time, I hope, they've got enough life boats. Quite how long it is before other great tragedies, catastrophes and disasters are resurrected for the pleasure of the socially dysfunctional I don't know, but I'm secretly dreading the creation, anytime soon, of a volcano-day Pompeii / Herculaneum Heritage-themed fun park. It's only a mater of time. I may be wrong, I sometimes am, but wasn't there a gulag themed fun park somewhere in East Europe where you could relive all the fun of Stalin's purges? Thank you - I thought, for one (joyous) moment that you were joking (after all, who on earth would create such a thing? ), but a quick Google (other search engines are available) of the phrase “Gulag theme park” brought me to “Grūtas Park” (Grūto parkas), unofficially also known as “Stalin's World”, a recreation of a Soviet-era work camp near Druskininkai, to the SW of Vilnius in Lithuania. Founded in 2001 by ‘entrepreneur’ Viliumas Malinauskas, a key feature of the visit is entitled “Survival Drama In A Soviet Bunker” where, for the equivalent of just £25, tourists can get authentically bundled into the back of a truck, strip-searched, pushed around, forced to stand for a long period of time in the cold, interrogated and generally shouted at by actors in authentic Soviet costumes. Apparently the experience, which is designed to show visitors “how, under a totalitarian regime, they are nothing” is popular with stag parties and corporations keen to generate ‘bonding exercises’ within their workforce. The online version of the Lonely Planet guide notes that the park was “built to resemble a Siberian concentration camp” and that “once through the turnstile, Russian tunes blast from watchtowers, and in the restaurant, visitors eat vodka-doused sprats and onions with Soviet-made cutlery. Tacky souvenir stalls are rife; there is a playground with old Soviet swings and a mini children's zoo - all of which lends itself to critics branding the park a diabolical version of Disney”. No need to go to Latvia - This already sounds like the university department I work in!